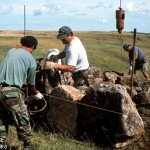 Experimental archaeology is the systematic approach used to test, evaluate and explicate method, technique, assumption, hypothesis and theory at all levels of archaeological research. 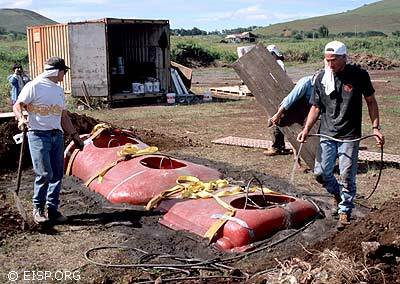 Our transport hypothesis assumes that the skills required to build, launch and handle Polynesian double canoes have direct counterparts in the land-based technology of Easter Island. Further, we assume the probable transfer and adaptation of these skills to the task of moving the statistically average moai. However, the workspaces in proximity to many statues are too narrow and cramped to allow more than a few men to work more or less simultaneously on any one statue (in the interior quarry, spaces average 30 to 50 cm wide). Undercutting some sculpture did not take place until nearly the entire upper surface of the statue was detailed and, in a few cases, finished. 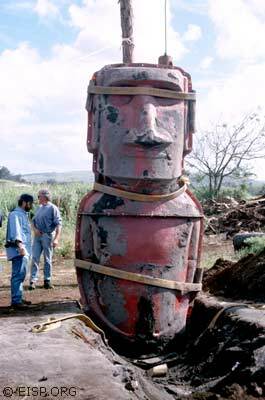 Nonetheless, there are many individual statues in discrete contexts within Rano Raraku that do not completely conform to these observations. Some early observers noted that the faces of many statues were carved first after the body was roughed out, but exceptions to that rule also exist. The point is that, while there was a general, patterned sequence of steps followed in quarrying, nothing was really “set in stone.” Clear evidence of methodological innovation or individual variation is present. Routledge’s precise estimate remains untested. However, it is unlikely that the numbers of people he suggests were ever involved as he describes, and the upper limit in many parts of the quarry could only have been about 15 carvers working at any one time. 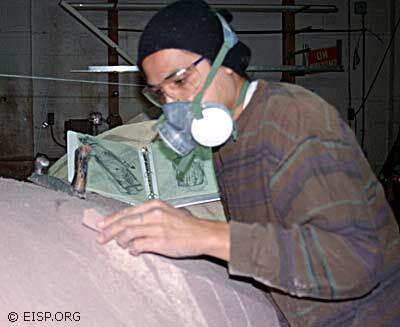 We documented the process of detailing and finishing the concrete replica of a statistically average statue that we used in the EISP experiment described here. 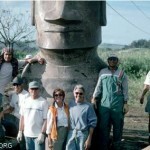 That work suggests that the crucial issue in detailing moai in the quarry was very definitely not numbers of people. 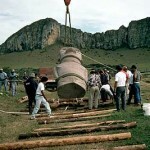 Defined archaeological parameters for our experiment were first established through extensive field survey in which up to 55 discrete measurements were collected on each of 887 individual statues localized in four site types, including five archaeological zones of Rano Raraku first created by the Universidad de Chile survey as conducted by C. Cristino and P. Vargas. The statistically determined average statue was drawn from a subset of 134 statues possessing 10 crucial measurements of overall form. Total height of the average statue is 4.05 m. To determine volume of this and all other statues in the database, we presumed each statue to be a cube, and calculated head and torso dimensions separately. Using these data, the estimated weight of the average statue was then calculated on the basis of a specific gravity of 2.1, a value arrived at by averaging three previously published estimates. Thus, we calculated (incorrectly, as it turned out) the weight of the average statue to be 12.5 m tons. The “reference statue” that fits these formal parameters and also possesses as many stylistic details as possible is Statue 01/53 at Ahu Akivi (16-001), an inland ceremonial site lying about 140 m above sea level on the southwestern slope of Maunga Terevaka. Ahu Akivi is reliably dated to after AD 1400 and before the mid-1600s. In 1960 Statue 01/53 and 6 others nearly identical to it were re-erected by W. Mulloy and G. Figueroa during restoration of the site. Statue 01/53 was broken transversely across the neck and, during restoration, the head was unintentionally replaced on the body slightly off-center and tilted. Photogrammetric data were collected by Van Tilburg on Statue 01/53 at Ahu Akivi. These data were amplified through the creation of an accurate 1/10-scale figure modeled in clay by professional sculptor Gary Lloyd. The model was then used to formulate a wide variety of hypothetical transport configurations. Following that, it was laser scanned and the resultant three-dimensional computer image integrated and cross-checked with field data. Finally, the image was then employed in a series of digital tests designed to evaluate and refine our hypothetical transport configurations. Field data reveal that 42.6% of statues are in the prone position and 31.9% are supine. Most statues in transport are prone, and that position is required to erect a statue on most ceremonial platforms. To ensure a flexible application of our hypothesis, we developed methods that would allow us to transport a statue in either position. In the face up, headfirst position the statue lay on two beams that automatically assume a non-parallel form due to the distribution of statue weight, creating a semi-triangular sledge configuration. In the face down, base first position, however, the statue must be raised from the ground by placing crossbeams to support the neck and protect the protruding features of the face. In both variations on the horizontal transport hypothesis, wooden rollers and/or sliders were required, and pullers positioned along two ropes achieved locomotion. UCLA’s Laboratory for Robotics and Animation, directed by Dr. Zvi Shiller, participated in the next stage of the research. The first step was to digitize a rough terrain map of Rapa Nui. 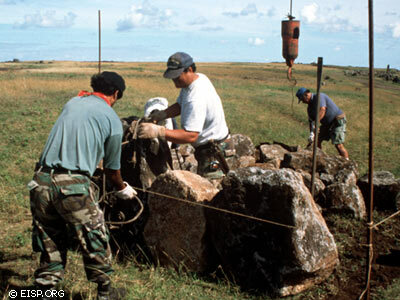 Robotics programs generated three alternative paths from Rano Raraku, where the statue would have been carved prehistorically, to Ahu Akivi, the “target site” 10-15 km away (depending upon the path). While all were viable, Path 1 had the strongest archaeological support. It was also optimal in that it is the shortest and most direct route (10.1) km. Although it required the largest maximum number of people (70), the required energy expenditure was lower than the other two routes because it took the least amount of time (4.7) days. The projected number of people involved in the transport task varied slightly on all three routes, and depended on terrain difficulty. We concluded that the average pull crew required for Path 1 was 48 people, and the maximum force required to pull the statue was 2.5 tons. Rano Raraku tuff is composed primarily of volcanic glass, plagioclase, augite, peridotite and allophane, with basalt inclusions varying in size and weight. The stability of the rock is adversely affected by its high degree of permeability. Statue weight may increase by as much as 10% through water retention. 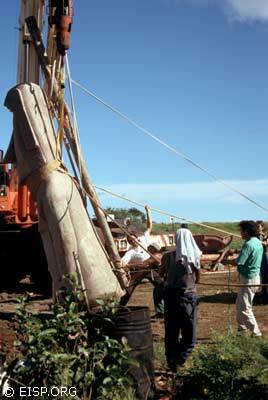 Previously published estimates of the specific gravity of Rano Raraku tuff had been obtained through rough tests of water displacement by small fragments randomly collected from unrecorded locales. These estimates varied considerably, as one would expect. As noted, we employed the averaged value of 2.1 to estimate all statue weights in the database. To obtain the more precise value necessary for this experiment we performed specific gravity tests on three of six samples of Rano Raraku tuff at a registered professional geotechnical lab (Krazan & Associates, Inc.). Two of three large tuff samples collected by Van Tilburg from the ground in one of five documented archaeological zones in Rano Raraku quarry were tested. 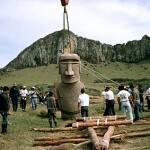 In addition, tests were run on the largest of two core samples taken by Claudio Cristino F. from the interior neck of one statue at Ahu Tongariki. The core sample was heavier (more dense) at 114 (wet weight) lbs. per cu ft (1035g), and produced a reliable specific gravity of 1.57. This, of course, lowered the estimated weight of all statues in the database. The revised weight of the average statue we used was 9.86 m tons. Our pre-tests at a California construction yard had three primary objectives: to determine breakaway and steady friction coefficient for our hypothesized statue transport configurations bearing representative loads (i.e. 10-12 tons); to determine the mechanical behavior of palm and eucalyptus wood under load, and to determine the pulling force of 10 people. 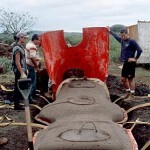 In addition, pre-test experience would give us insight into handling materials and organizing the workforce on Rapa Nui. The trees of Rapa Nui’s prehistoric palm forest had a theoretical ability to attain smooth, cylindrical but uneven trunks more than 1 m in diameter. There is no evidence, however, that they ever attained this maximum size, nor is it clear that, if they did, their trunks would have been useful in statue transport. Rather, many “prints” of palm trunks embedded in hardened lava on the northwest coast of Rapa Nui (as documented by G. Figueroa) measure a less unwieldy 30 to 40 cm in diameter or less. Three separate test configurations were structured. We planned to test large diameter palm wood rollers and smaller diameter palm wood rollers (probably used in antiquity) on a hard surface, and then to slide the load directly on palm wood sliders. The tests would then be repeated with eucalyptus. A pair of concrete “Jersey barrier” highway lane dividers resting on a 2.5 cm steel road trench plate represented statue weight and size. This assembly, in turn, rested on a pair of 33 cm diameter palm trunks, 7 m long, arranged in a narrow “V” form, representing the transport sledge. Finally, the sledge was set directly on the rollers or sliders and the entire assembly pulled by a fork truck with a 10,000 lb spring scale in place. Results clearly demonstrate that palm wood is fully capable of bearing the requisite experimental load. Importantly, we learned that large diameter (33 cm) palm rollers allowed the loaded sledge to be moved, but because of irregularity in roundness the rollers did not stay true beneath the load. Instead, they tended to wander and jam into each other, resulting in only very limited progress before adjustment of the rollers with levers was required. To deal with this problem, we incorporated into our hypothesis the Polynesian concept of the canoe ladder. A canoe ladder is made up of a series of ladder segments joined together and laid down over a rocky coastline, extending into the water. A skilled steersman can bring a canoe in line with the middle of the ladder, wait for a wave surge, and then paddle it up and onto the ladder. With enough hands, the canoe can then be pulled up out of the water onto land. The ladder provides support for the canoe on a compliant surface that will allow it to slide without gouging its hull over terrain that is uneven. 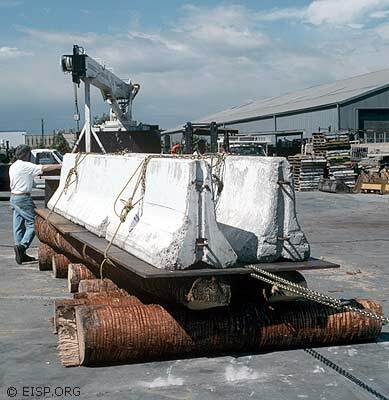 Although pulling force requirements are higher with sliders such as a canoe ladder, greatly improved manageability of the load has resulted in its universal use throughout the Pacific. 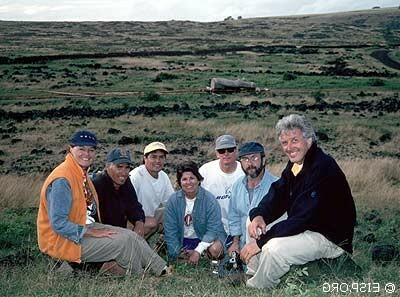 There are many places along the Rapa Nui coastline where a canoe ladder would have been useful to ancient fishermen, and it is certain that the concept was known. We rightly anticipated that during our full-scale statue transport experiment a canoe ladder would have to be employed. Other useful results gained during pre-tests were that breakaway force with large diameter rollers was about 2800 lbs., equivalent to a friction coefficient of just over .1. Once rolling started, the load drops to half the breakaway. However, as stated above, rolling was virtually impossible to ensure or manage except for very short distances of 1m to 1.5 m. Once we saw how rollers behaved, we abandoned specific evaluation of smaller diameter rollers and turned to sliders. 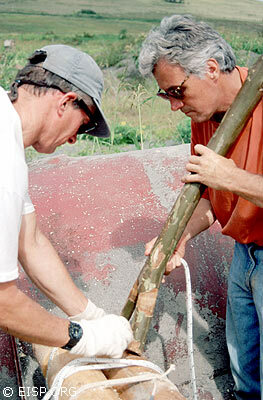 Rather than reconfigure the pre-test to put lateral sliders (canoe ladder rungs, as it were) under the load, which would have taken several hours, we merely chocked the large-diameter palm rollers already in place using 30-degree wedge sections cut from palm logs. This was intended to keep the rollers from turning, resulting in sliding action. Rather than promote sliding, the action of the chocks caused the rollers to roll up-slope. We halted this experiment at a load of 8000 lbs., to avoid over-ranging the scale. From this result, we can say only that the sliding friction coefficient, as it should be, is higher than the rolling coefficient. We now reconfigured to test smaller diameter, uneven eucalyptus logs for their ability to act as sliders. Pulling, we achieved sliding at 4000 lbs. load or higher, but not of the sledge upon the sliders—rather, the sliders acted as part of the sledge. From this we concluded that the dry wood-on-wood sliding coefficient is above .2 and probably in the “textbook” range of .4. We did not apply lubrication to reduce friction coefficient although liquid from pounded banana stump fiber mixed with water is often used in Polynesia for such tasks, and we employed it during our on-island experiment. To determine the pulling power of people, we arranged a parallel pulling line similar to one we would use in the full-scale experiment and had 14 outrigger canoe male and female paddlers exert continuous effort measured by the scale. We reasonably estimated 100 lbs./person, which would be sustainable as long as footing was available. Analyzing everything, we drew several conclusions: rollers may work but managing them is difficult; eucalyptus is at least as strong as palm wood and can be used as a substitute for palm unavailable on modern Easter Island and, finally, that working with a large, heavy load requires a well-secured and robust support structure (sledge) and the ability to control motion in all directions. Cutting 75 full-scale paper sections from 3-D solid geometry digital data produced 75 7 cm thick foam layers that, when stacked and assembled vertically, created a full-scale statue. It became immediately obvious that the photogrammetric fieldwork had accurately recorded the slightly off-center position of the head on the torso of the real Statue 01/53 at Ahu Akivi, and that error was transferred to the paper patterns and then to the foam statue. Cutting and trimming the foam was necessary to recover the correct shape. This work was done by Rapa Nui sculptor Santi Hito under Van Tilburg’s direction, and was incredibly difficult. The nose (which aligns and scales all dorsal features) was the biggest challenge. 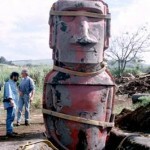 Eventually, a satisfactory solution was achieved, and fiberglass was hand laid-up over the foam statue to create a mold that was then transported to Easter Island in four pieces and reassembled. A rebar cage for strength and ten tons of concrete (1-1-2 cement-sand-red scoria, 130lb/3ft density) was machine-mixed and hand-placed into the mold, which was buried in sand. 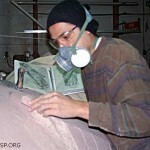 Four days of curing produced a 10-ton statue replica that then required 24 hours of finished carving by Arévalo and Hito. 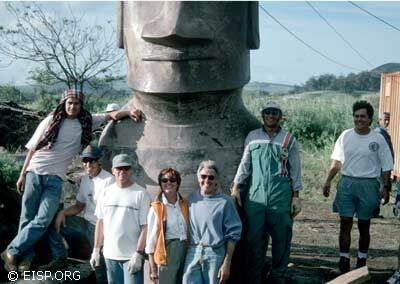 In this way, the moai was given some surface details and textures and the head and base shapes were modified. Additional corrections required to turn the statue into an accurate work of art would not be completed until after the experiment was over, and would take Arévalo and a part-time assistant 25 days to accomplish. The wooden transport sledge we designed was composed of two eucalyptus trunks laid in a tight-V modified to a semi-triangular configuration by a lashed crossbeam and derived directly from hull and outrigger forms of well-documented Polynesian canoe models. The pegged and lashed frame had inherent characteristics of balance, strength and flexibility, much as would a voyaging canoe designed to carry heavy loads great distances. 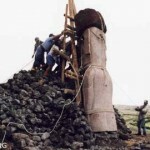 For the first two experiments, the replica moai was placed face up and base down on the transport sledge. Parallel beams of eucalyptus were set out on the ground for use as rails on which wood rollers were placed. Forty persons pulled the statue on its sledge, with 20 stationed on each of two pull lines. Six additional men with levers were positioned on each side of the sledge to tend rollers. For the first pull, the statue on its sledge was hauled at a fast walk (approximately 5 mph) for about 5 m. Almost immediately, the rollers became so misaligned that the sledge slipped to one side. Each of these two attempts ended with rollers completely jammed, just as our pre-test had predicted. 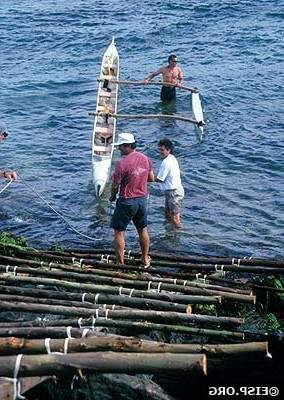 With the rollers unsuccessful, the experiment halted and the transport sledge was re-configured to incorporate the physics of the Polynesian canoe ladder. Essentially, three rollers were lashed to the triangular frame of the sledge to keep them from going astray, in effect becoming sliders. The second experiment resulted in two quite successful pulls, one of 40 m and another of 70 m. Pulls were limited only by the available rail material laid out on the ground in the direction of travel and/or by rock outcroppings that impeded movement. Between pulls, the rails were repositioned. Coefficient of friction was established at 0.2, which surprised us with its low value, and about half that once sliding commenced. Sliding was greatly enhanced by lubricity of the de-barked eucalyptus. The third experiment was conducted with the statue face down, base first on the same transport sledge. To support the head and neck, the statue was raised slightly by placing a “triple stack” of lashed logs laterally across the sledge and lashed in place at the statue’s upper torso level (Figs. 4, 5). The slight concavity in the upper torso of the moai was located at exactly the required point and the statue quite naturally accepted this lateral beam. The statue was then pulled 50 m, 30 of which were along a road-path and 20m up an 8% grade ramp to the replica platform where it was to be erected. No rollers were used on the ramp. 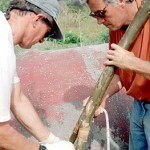 Instead, individual “rungs” of a “canoe ladder” were spaced up the ramp then lubricated with water/banana stump liquid. The 20 m distance was covered in an astonishing 15 seconds. The statue was then positioned for the raising experiment that followed. Computer modeling suggested that 55-70 people (or 48 average) were required to pull the average statue of 12 m tons over Path 1, and that their collective food requirement would have totaled 201,600 calories per day from agricultural staples such as sweet potatoes and bananas. Our experiment demonstrated that 40 people were fully capable of pulling a 10 m ton statue. It is estimated that 65% of males and females between the ages of 10 and 65 are available for the average extended family “work force” in contemporary Polynesia. Our hypothesis was that males performed the actual work, while females and children provided support. 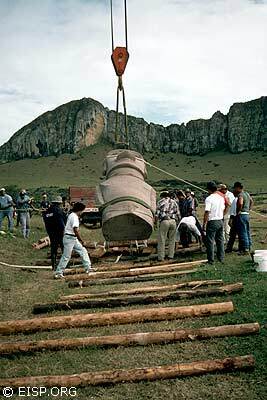 In fact, however, during the experiment women made up the larger part of the pull crews, while males only were allowed by the Rapa Nui crew chiefs to perform the heavy and far more dangerous tasks of levering in proximity to the statue. 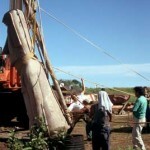 The pull crews generated a great deal of excitement, camaraderie and shared purpose during the transport experiment, and this sort of community participation was certainly required and valued in prehistory, part of the euphoria of the statue cult experience. 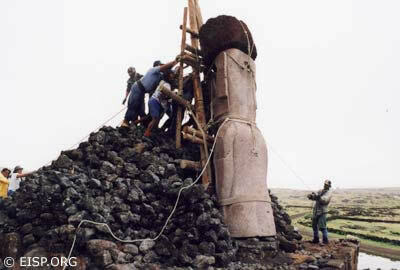 The wood sledge served as an efficient gantry on which the pukao was neatly balanced and against which workmen levered without damaging the statue. Only 20 expert individuals were required to erect the statue over 3 days. 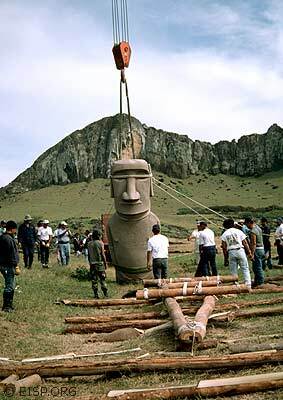 Just as a master carver and apprentice were preferable to a large gang of workmen in the quarry, large crowds of willing workers were neither necessary nor safe while erecting a moai on image ahu. Substantial unskilled labor was required to collect, transport, stack, move and restack large rocks used during raising. It is fair to say that our manpower estimate remains viable, with an optimum actual task involvement of 55-70 people. Our hypothesis that 5 m of ground would be covered with each discrete pull was low, and a total of 5-7 days for moving the average statue some 15 km over Path 1 is reasonable. 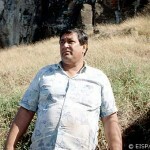 The estimated size of the average Rapa Nui chiefdom thus remains at 8.7 extended families or 395 to 435 people. 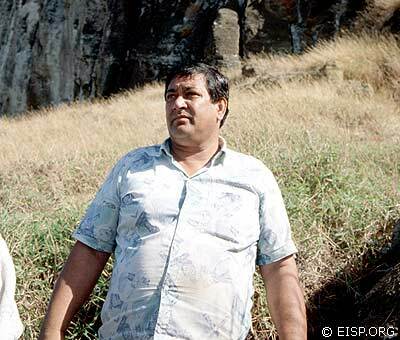 The estimated resources of approximately 50 acres of agricultural crops were required to support this effort, or double the extended family norm for East Polynesia, with supplementary marine resources required as per oral traditions. Projecting our average statue vs resources estimate unto the ultimately deforested island’s ecological and cultural stage creates a dramatic economic picture. Moving statues 11-12 m tall and others up to 10 m tall required proportionately greater resources than did moving and erecting average sized statues (4 m tall). 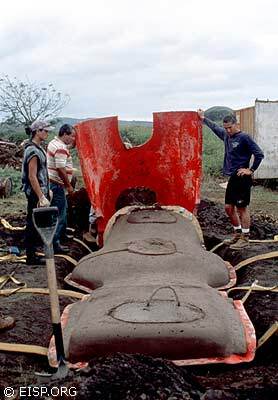 Given the number (313) and size of Rapa Nui ahu, their construction over about 300 years of peak activity added at least 25% to the total food requirements of the island’s estimated population (see J. Diamond in “Collapse”). Furthermore, we estimate that the final building stages of large-scale ceremonial architecture moved appreciably more stone and demanded more resource investment than did transporting their associated statues. One hour program describing my experimental archaeology project examining pre-industrial technology in an island chiefdom. We created, transported and erected a replica statue representing the average figure. Michael Barnes, Producer. 1997.